"For those who really like sweet food, you may also top the pudding off with a drizzle of coconut cream or a mild fruit such as bananas. This is a traditional recipe my friend's mother brought with her from Thailand. Some of the ingredients might be hard to find in the non-coastal areas of the USA. 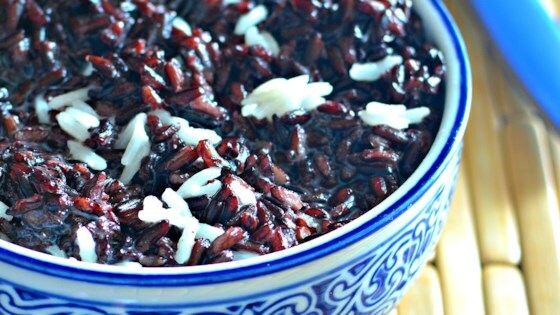 There are a number of online import retailers that carry these ingredients"
Rinse and drain glutinous black rice and glutinous white rice, then combine with sugar and water in a large saucepan. Bring to a boil over high heat, stirring frequently. Reduce heat to medium-low. Cover and cook until rice is tender and creamy, stirring occasionally, about 45 minutes. Stir in coconut cream and vanilla extract. Serve warm. Quite authentic! However I found I did not have to simmer for 45 min to get it cooked. 25 minutes was sufficient. The black glutinous rice gives the pudding a lovely purple colour.